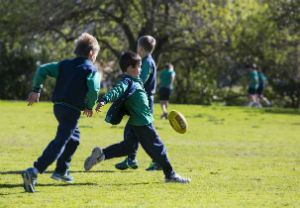 The Health and Physical Education program at Auburn South Primary School provides students with the knowledge, skills and behaviours to enable them to develop and maintain their physical, mental, social and emotional health. The program actively promotes the importance of a healthy lifestyle and physical activity through the development of motor skills and movement competence, health-related physical fitness and sport education. A large number of students also have the opportunity represent Auburn South Primary School at a number of District, Regional and State level sporting competitions and carnivals.